I’m getting into a groove by about now. Suse would wake me in the morning, we’d given up on the Just Right and gone for an Up and Go and get outta here attitude. She was upping her distance to 25 kms and feeling pretty psyched about what she was achieving. We’d had dingos around the previous night and made sure our shoes were in our tent. Didn’t need to lose a shoe about now. We left camp and finally enjoyed the softer terrain underfoot. Those first 30kms were so welcome. 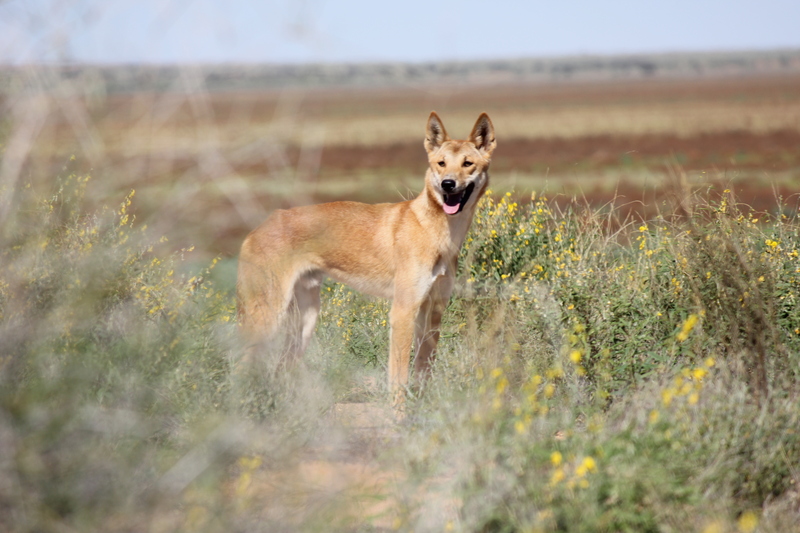 The dingos were hot on the scent of some small person……..
Beautiful photo by Garry Tapper. The crew were so fabulous. Not once did they question what I was doing, if I could do it, did they know better? Nup. They were totally committed to helping me achieve my goal… and they trusted my judgement. I had a race plan and I stuck to distances like glue. Never once did they suggest that I was over stepping limits, should slow down, speed up, take a day off… They totally believed I knew what I was doing…… did I tell you that they’d never met me before?? So the temperature was steadily dropping. Only a top of 42 C today. My legs felt fine, my heel blisters were no worse. I popped them every night, dried them with an alcowipe and left them to dry out overnight before Friars Balsam and hyperfix did their charm all day. I reckon I was winning. Our maps suggested that Purnie Bore was only 68kms away but I’d done some web search and guessed over 70kms. My back was still hurting… my calves, quads and hammys were feeling fresh ……… the sand dunes had appeared and I was happy to see them. Crew saw some emus, I just wanted to see Purnie Bore…. 72 kms of running and there she was. How exciting…. a drop toilet that I wasn’t going to touch after seeing the beady rat eyes staring up at me last year…. How stupid that a place like Purnie Bore can be a landmark to get excited about. 72km day…. Spent the afternoon glueing velcro to my shoes and getting to know the other idiots. My tent reached 50 celcius today. Others are talking about running in long sleeves… I want to SPF50 and singlet it.